Edward Hopper, the man of many movements. Whether it be romanticism, realism, symbolism, or formalism, Hopper has covered them all. I am not going to analyse which oeuvre he was best suited to, nor to which he owes the most allegiance. Instead I am going to try and find the man behind the paintings…. Ok, let’s fast-forward Hopper’s life a little… and hello Josephine! A fellow artist and former student of Robert Henri (a past teacher of Hopper’s), Josephine Nivison was ‘The One’. She was the Simon to Hopper’s Garfunkel, or the Kate to Hopper’s Wills if you want to be a little more current. Model, Manager, Life-Companion, she truly supported her husband (publicly) in every way, which can be seen in the numerous paintings in which Hopper uses her to model various characters and figures. Oil on canvas, 68.6 x 104.1 cm. He moves us here away from the subconscious of the audience but, instead, to that of its creator – the painter himself. Such being the case, Hopper’s choices and preferences for light and dark are filled with new meaning. If you have a look at one of his more well-known works, ‘Nighthawks’, the dark palette of the street scene combined with the shadows of the well-lit interior presents a sinister tone. No longer do the figures within the diner possess a careless, lonely air, but rather, they become more predatory in appearance. We, as the audience, cannot tell whether Hopper identifies with one of the inner characters, one of the predators, or instead with us, the viewer – always on the outside, looking in. Oil on canvas, 84.1 x 152.4 cm. Indeed, this seems to be a recurrent theme with Hopper. The audience of his work is often treated to the image of a solitary figure, either through a window, or in a state of undress, to which we then have the impression of being voyeurs. The figure (or figures) in the painting is often portrayed as being unaware of the artist/audience. 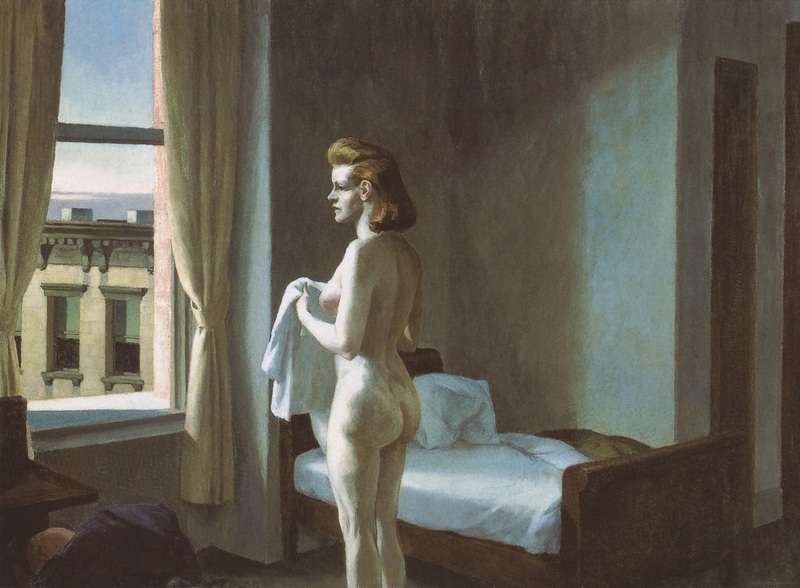 As an example, take a look at ‘Morning in a City’, as modelled by Hopper’s wife Jo. The idea of voyeurism continues. 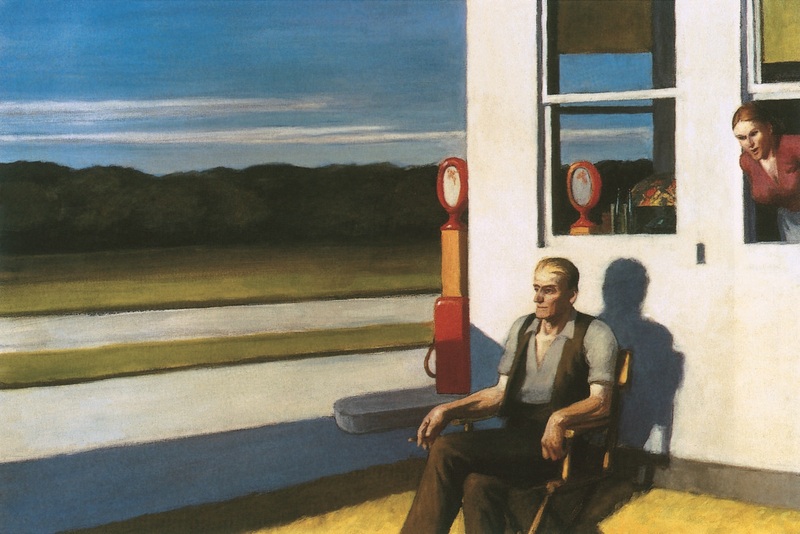 But, with the question of the subconscious ever present, we may start to wonder at this being Hopper’s go-to perspective. Does this mean that Hopper himself feels voyeuristic in painting, or is this a reflection of his feelings when he was amongst his peers in society; that he was on the edge, forever looking in? Morning in a City, 1944. Oil on canvas, 112.5 x 152 cm. Williams College Museum of Art, Williamstown, Massachusetts. 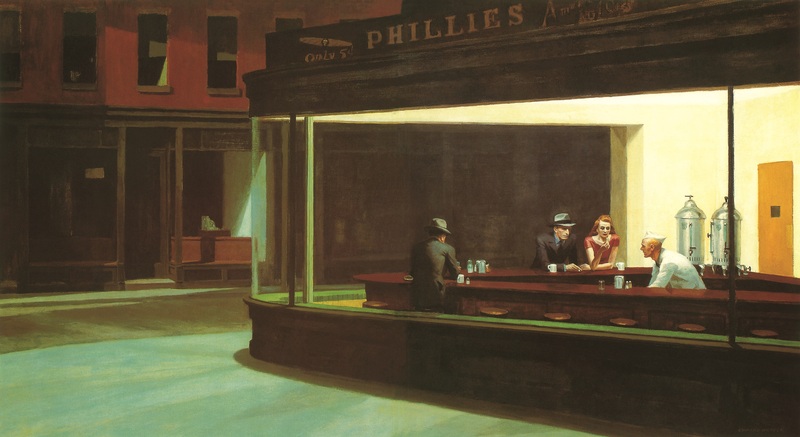 So, the mystery of Edward Hopper will have to go a little longer with being unanswered I think. However, one thing we do know for certain is the regard that he bore his wife Josephine. As I have previously mentioned, she was with Hopper for nearly every step of the way; his painting career, his public career, his life! Although perhaps not the most tranquil of marriages (perusal of her private diaries would no doubt lead many stable couples to run screaming ‘divorce! divorce!’ down the streets), it is all the more touching to view Hopper’s final work, ‘Two Comedians’. It shows two actors on the stage of a theatre, taking their last bow. This is increasingly more poignant due to Hopper’s life-long love of the theatre, and upon closer inspection of the figures, we can see that the models are Hopper and Josephine themselves. 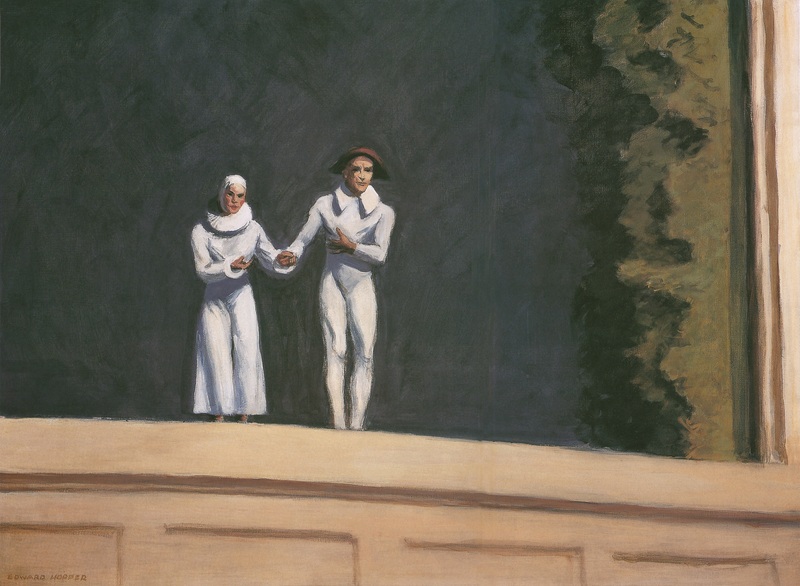 After Hopper’s death in 1967 (1 year after the completion of ‘Two Comedians’), Josephine confirmed the suspicions of many, that her husband had intended it to portray the end of their life together. In the end, this is the story that will stay with me from Hopper’s paintings. Outsider or keen observer, it doesn’t matter, what remains in his work is the love story he wrote together with his wife. Tumultuous and stormy maybe, but it is a love story that remains unending. Oil on canvas, 73.7 x 101.6 cm. Collection Mr and Mrs Frank Sinatra. Venturing to the Grand Palais in Paris between the 10 October 2012 and 28 January 2013 will afford you the chance to catch up with the iconic painter that is Edward Hopper. Discover the early and the mature works of one of America’s finest painters. See for yourselves where his mastery truly lies; with the lighter style of the Impressionists, or with the darker palette of his Rembrandt-fascination. Discover, if you will, his life with Jo, as depicted in his art. Alternatively, feel free to peruse at length ‘Edward Hopper’, written by Gerry Souter.